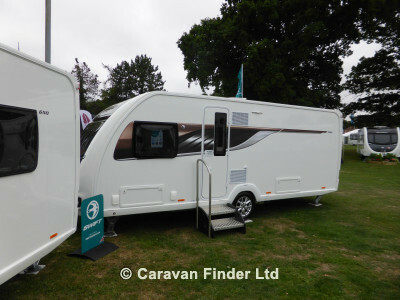 Representing decades of experience and countless innovations, the Swift Elegance offers an exquisitely refined touring experience that is second to none. 2019 is no exception; the Elegance comes with New SMART 3 construction - the third generation of totally timberless SMART caravan construction featuring a New revolutionary floor construction and a lifetime water ingress warranty (subject to T&Cs). A New sweeping, aerodynamic front panel, incorporates triple flush fitting opening windows and a New panoramic sunroof design. Stylish graphics, premium jockey wheel, bright LED road lighting and a rear view camera are just some of the finishing exterior touches. The expanded eight model range including three twin axle layouts are all lavishly appointed and perfectly proportioned. The luxurious interior is immaculately designed and cleverly detailed. You can create the perfect ambiance thanks to the positioning and versatility of the energy efficient LED, from front pillar lights to dimmable spots and New illuminated pelmets above side windows.